The Material Mom walked through an African village on Sunday afternoon. Madonna appeared in court Monday in the capital of Malawi, where she was trying to adopt a 4-year-old girl as her second child from the southern African country. A Malawi court official said that Madonna would not know until Friday whether she would be allowed to adopt the child. Court official Thomson Ligowe confirmed that Madonna's adoption application was adjourned by the court until the end of the week. The American pop star, dressed in a black skirt and black high heels, entered the courthouse in Lilongwe through a back door. She left about an hour later and it was not immediately known where she was headed. The one adoption case on the court docket lists only the child's name — Chifundo James. The case was to be heard in a closed session before Judge Esme Chombo. A welfare official and another person involved in the case say Madonna hopes to adopt a 4-year-old girl whose mother died soon after her birth. They spoke to The Associated Press on condition of anonymity because of the sensitivity of the case. Madonna has not commented on the adoption and did not speak to reporters Monday morning. She adopted her son David, 3, in Malawi last year. Children's advocacy groups have accused her of wielding her immense wealth and influence to circumvent Malawian law requiring an 18- to 24-month assessment period before adoption. Madonna brought both David and her 12-year-old daughter, Lourdes, to Malawi this time, arriving Sunday. David then spent 2 1/2 hours with his biological father at an exclusive lodge where the pop star is staying. "I was very happy to see him," Yohane Banda told The Associated Press, adding that David did not recognize him. "He asked me who I was." David's mother died when he was a month old. His father has said he believed he could not care for him alone, and that placing him in an orphanage was the best way to ensure David's survival. On Sunday, Madonna and Lourdes visited a Malawi village and Madonna spoke to residents and looked over drawings for a new school there. 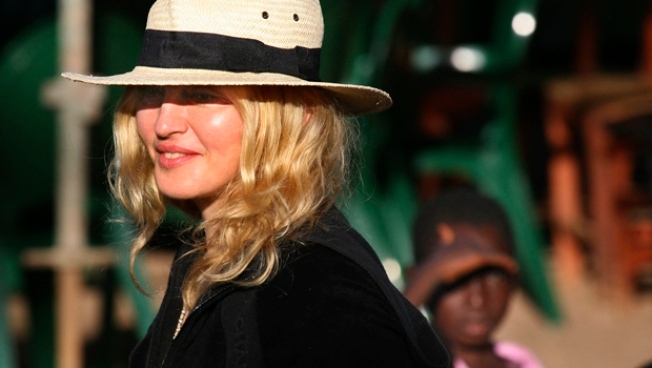 Madonna first traveled to Malawi in 2006 while doing charity work and filming a documentary on the devastating poverty and AIDS crisis here. Her Raising Malawi organization, founded in 2006, raises funds to fight poverty by providing food, shelter, education and health care for children here. The U.N. estimates that half of the 1 million Malawian children with one or no parents was orphaned by AIDS, and that the virus that causes AIDS has infected 14 percent of adults here.